notearray -- Extract 2-D array of notes from **kern spines for numeric analysis. ⓘ -a Store the absolute beat position for each line starting from the beginning of the music. ⓘ -b Store only bibliographic record (reference records) as comments in the output data. ⓘ -c Insert a column-type description number as the starting row of the note array. ⓘ -d Represent notes as absolute diatonic (base-7) numbers. ⓘ -e Store and ending sonority which preserves the note-off state of the last notes in the score. ⓘ -f Represent metric position and absolute beat positions as rational numbers, using only fractional values. Also see the -r option. -j Use Josquin preset options: "-t 1 --double". ⓘ -k Generate a column of note names in the text-based **kern format. ⓘ -l (lowercase L) Display the line number in the original file for the sonority as a value in a column on the far left of the array. ⓘ -m Represent notes as absolute MIDI key (base-12) numbers. ⓘ -o # Octave offset for pitch numbers. ⓘ -r Represent metric position and absolute beat positions as rational numbers. Integer part of the number is separated from the fractional part by a plus sign. For example, 3.5 is displayed as 3+1/2. Also see the -f option. ⓘ -t beat Specifies the timebase of a beat with which to do a rhythmic analysis of the score. By default, the beat will be defined by time signatures within the score. However, if a fixed-width beat should be used throughout the score to identify beat locations, then use this option. For example, -t 2 means to set the beat duration to a half note; -t 4. would set the beat to a dotted quarter note. ⓘ -1 (digit 1) For --attack, --next and --last options, start the index values at 1 rather than 0.
ⓘ -A Display all location information columns at left-side of note array. Equivalent to using the options -l (lowercase L) and -a.
ⓘ -B Do not display a column for the beat position of the sonority within the measure. ⓘ -C Do not display any comments (including bibliographic records) in the output data from the original input file. See also the -b option. ⓘ -D Generate a column of durations for each row. ⓘ -H Print output data in a Humdrum file format. ⓘ -I Don't show the header comment describing the data type of each column. ⓘ -M Do not display a column for the measure number in which the sonority occurs. ⓘ -N Do not display any information columns to the left of the notes on each line of the array. Equivalent to using both of the options -C and -M.
ⓘ -S Suppress display of data lines which only contain note sustains and no note attacks or rests. ⓘ -T Print tie start/stop markers on a single note if a note attack does not continue as a sustain on successive rows in the array. ⓘ --attack Generate an index column for the attack of each note in a note column. ⓘ --double Place a row of rests when a double barline is encountered in the data. ⓘ --math var Output the data in a format which can be loaded into Mathematica. The var string is the variable name for the note array in the output data. 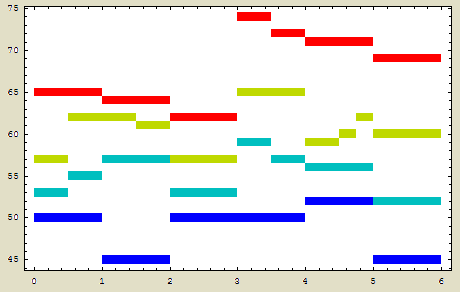 --mel Display all melodic note index columns (equivalent to --attack --last --next). ⓘ --mo # Measure number offset between multiple input files, typically using a value such as 1000, which would store the file number in the thousands digit, and the measure numbers within the file in the first three digits. ⓘ --no-tie When the -k option is used, do not include tie information ([ = start of tied note group; _ = middle note in tie group; ] = end note in tie group. ⓘ --offset # Indices for the index column as well as attack, last and next index columns start at the given positive integer rather than 0, or 1 (when the -1 option is used). ⓘ --quote Place quote characters around pitch names generated with the -k option. ⓘ --sa Generate a single absolute beat count across multiple input files. ⓘ --sep Place a separator comment line between analysis data from different input files. The notearray program takes an input Humdrum file with one or more **kern spines and outputs pitch information for the musical score as a two-dimensional array. Each row of the output data represents a sonority within the score with note attacks represented by positive integers, notes sustained from previous sonorities as negative integers, and rests as the value 0. Each column represents a voice in the score. In this example, the first column of output data shown on the right contains the measure number in which the notes on each line were extracted. The second column list the beat within the measure at which the notes occur. Then there are four columns (one for each input **kern spine) which stores the pitch information of each spine. The default numbering system used in the output data is the base-40 system (described below). In this case the number 128 means D3, or the note D a seventh below middle C. When a note value is negative, this indicates that the note is being sustained from a previous sonority within the score. Note values of 0 represent rests. For base-12, the default octave for middle C is 5 so that it matches MIDI key numbers, while in base-40 and base-7, middle C's octave is set to 4 so as to match the ISO labeling of octaves. If the input data contains very low notes, then some pitches will incorrectly be assigned to negative octaves (and 0 may represent a pitch as well as a rest). To avoid these cases, use the -o # option to transpose the integer values for pitch up the specified number of octaves to avoid negative octaves in the output data (since negative values are intended to represent sustained notes). Note in the above example that 202 is 40 (the base-40 octave) greater than 162, since the notes in the "-o 1" column are an octave higher, and the notes in the next column are 80 greater than the original data since they are two octaves higher. As an example, consider the interval between E4 (174) and C4 (162) which is 174-162 = 12, representing a major third according to the table shown above. All intervals can be constructed by observing that major seconds are 6 and minor seconds are 5, so note that a major third, consisting of two major seconds, is 6 + 6 = 12. Below is an example segment of music with the pitches labeled in the base-40 system. 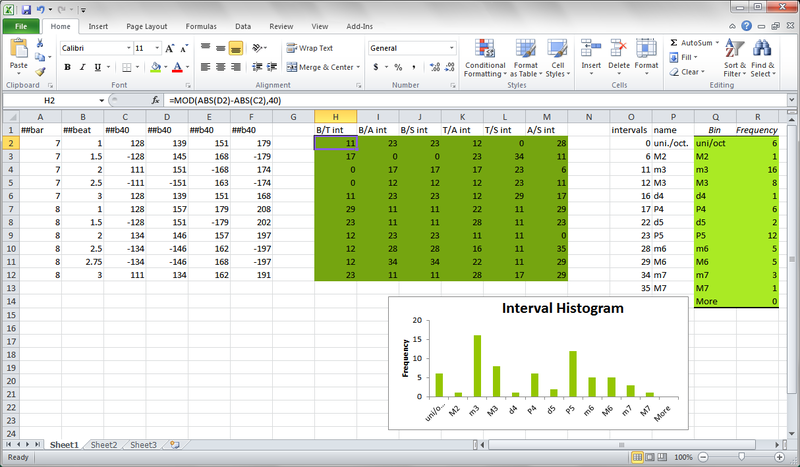 Try subtracting values and comparing the results to numbers in the base-40 interval-class table above. Base-12 numbering of pitches assigns 12 notes to an octave as on a standard musical keyboard. The values output by the notearray program match the values used as MIDI key numbers, where middle C is assigned to be 60, C♯4/D♭4 to 61, D4 to 62, etc. This makes the octave value for middle C up to the B a major seventh above to be one higher than for the base-40 or base-7 outputs from notearray at 5, compared to 4 for the other numbering methods' middle octave. Using the option "-o -1" will make the base-12 numbers match the same octaves as base-40 and base-7; or conversely, you can use "-o 1" for base-40 and base-7 outputs so that the middle-C octave is 5 to match that of the base-12 output. Base-12 chroma do not map one-to-one with diatonic-based pitch-classes. For example, C♯4 and D♭4 belong to different diatonic pitch-classes, but they have the same base-12 pitch value (represented by the number 61). 0 = B♯, C♮, D♭♭, etc. 1 = B♯♯, C♯, D♭, etc. 2 = C♯♯, D♮, E♭♭, etc. 3 = D♯, E♭, F♭♭, etc. 4 = D♯♯, E♮, F♭, etc. 5 = E♯, F♮, G♭♭, etc. 6 = E♯♯, F♯, G♭, etc. 7 = F♯♯, G♮, A♭♭, etc. 8 = G♯, A♭, B♭♭♭, etc. 9 = G♯♯, A♮, B♭♭, etc. 10 = A♯, B♭, C♭♭, etc. 11 = A♯♯, B♮, C♭, etc. Base-12 maps one-to-one with pitch frequencies in an equal-tempered scale, but not necessarily in other temperaments. For example C♯4 and D♭4 are both represented by the base-12 number 61, and they also map to 277.183 Hz in equal temperament when setting A4 to 440 Hz. However, in other tuning systems and temperaments with more than 12 notes, C♯4 and D♭4 may map to different fundamental frequencies (for example in string-quartet performances). Base-7 is a representation of the pitches in diatonic form without any accidental alterations. For example, C♭4, C♮4, and C♯4 are all represented by the number 28 = 0 + 4 * 7, where 0 is the base-7 C chroma, 4 is the octave and 7 is the base. Base-7 values are another method of stripping accidental information off of base-40 values. 0 = C♭♭, C♭, C♮, C♯, C♯♯ etc. 1 = D♭♭, D♭, D♮, D♯, D♯♯ etc. 2 = E♭♭, E♭, E♮, E♯, E♯♯ etc. 3 = F♭♭, F♭, F♮, F♯, F♯♯ etc. 4 = G♭♭, G♭, G♮, G♯, G♯♯ etc. 5 = A♭♭, A♭, A♮, A♯, A♯♯ etc. 6 = B♭♭, B♭, B♮, B♯, B♯♯ etc. The -k option can be used to include a column of note names before each numeric column describing the notes. The --quote option may be used to enclose the kern pitch name in quotes. The --no-tie option can be given to hide tied note information on the **kern note name. The -T option can be used to mark a tie-start ([) and tie-end (]) on a note which only exists on a single row (i.e., it does not sustain past the current row). The output note array data can be formatted in three styles. The default output style is suitable for loading into matlab, where the data represents a matrix with tab characters separating values in each row. The -H option will generate data in a proper Humdrum file format. The --math option will format the output data into a form which can be read into Mathematica. 1000 = **kern-style (text-based) note names. 1007 = Note column for a voice/part in the score, specifically in base-7 encoding (diatonic pitches without accidentals). 1012 = Note column for a voice/part in the score, specifically in base-12 encoding (MIDI key numbers). 1040 = Note column for a voice/part in the score, specifically in base-40 encoding (diatonic pitches with up to double accidentals). 2000 = Line number of sonority/matrix row in input file. 3000 = Measure number of row. 4000 = Beat position of row within the measure. 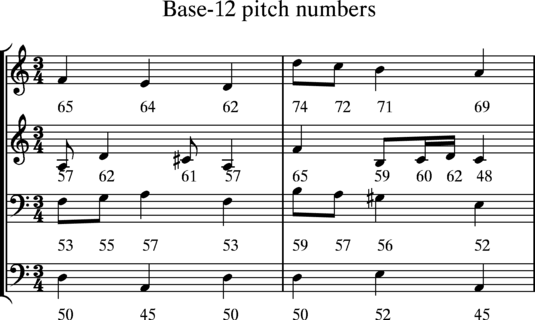 5000 = Absolute beat position of the row within the score. 6000 = Duration of the current row of notes. 7200 = Reverse indices to the attack of the previous note. An index column (generated with the -i option) will not have a type number, and all rows in the index column will represent line indices for that row of the array. Typically the index column is not needed by processing program which can count the lines of the array by themselves, and the index column is more useful for human readability of note index values. Specifying the -H option will format the output data as a Humdrum file which can be further processed with Humdrum tools. Notice that the text string after the --math option name (twobars) was used to set the name of the data in the above output. 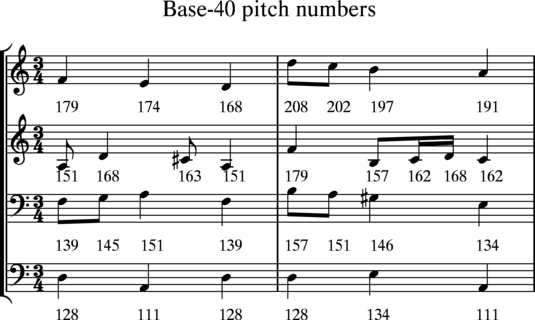 The -a option was used to add an additional column of information showing the absolute beat position within the score of each data row (the score duration since the start of the music). The -m option was used to display pitches in base-12 (MIDI key number) format. When multiple input files are processed by notearray, the Mathematica-formatted output will contain a nested list of data for each input file. Two additional informational columns are also available. The -l option will display the line number in the input Humdrum data from which the sonority was extracted. This is useful when linking analysis data back to the orignal score. The -a option will display the absolute beat position which is the duration between the start of the music and the beginning of the sonority. All five information columns can be displayed by using the -A option, which is equivalent to giving the -l, -a and -D options. Information columns will always be displayed in a fixed order: (1) line number in original file, (2) measure number, (3) metric position, (4) absolute beat position, and (5) row duration. Using the -i option will cause the first column in the array to display the line index for each row of the array. By default, the indexing starts at 0, but can be started at 1 by using the -1 (numeral one) option. Other positive starting index values can be specified with the --offset # option, where # is a positive integer. This option is useful when concatenating individual arrays together into a larger array. -a Add a column of numbers which indicates the starting position of the sonority relative to the start of the music. -l (lowercase L) Add a column of numbers which indicates the line in the input Humdrum data from which the notes in the row were extracted. -D Add a column of with the duration of each row. This is equivalent to subtracting the absolute beat position of the next row from the current row. The duration of the last row in the array is similar to including a rest row with the -e option to record the absolute beat position of the ending of the last row sonority. -i Add a column of numbers which indicates the row index of the current line in the note array. Index values start at 0 unless the -1 option is used to start them at 1, or the --offset option is used to start the line indexing at another value. -N Suppress display of default position information columns (measure numbers and beat positions within the measure). Equivalent to using the two options "-MB". -A Display all position information columns (except the index column generated by the -i option). Equivalent to using the two options "-la". -M Suppress the display of the measure number column. -B Suppress the display of the beat number column. Beat and absolute beat positions are displayed as floating-point numbers by default. If you need to avoid round-off errors for tuplets, you can use the -r option to display these values are rational numbers. In the following examples, numbers such as 1.5 in the beat column are converted into numbers such as "1+1/2". --attack Store an index of the note attack for the currently sounding note. The attack index column will be placed immediately to the right of the note column it describes. --last Store an index of the previous note attacked in the note column. The last-note index column will be placed immediately to the right of the note column it describes. --next Store an index of the note attack for the currently sounding note. The next-note index column will be placed immediately to the right of the note column it describes. --mel Store all melodic index columns for each note column. Equivalent to using the options --attack, --last, and --next. The current, last and next note-attacks information stored in these index columns can be generated relatively easily in the programming environment which loads the note information, but the indexing options are provided for convenience. With the information in these index column, the duration of each note can be calculated from a simple algorithm: The duration of the current note is the difference between the absolute attack time of the next note minus the absolute time of the attack of the current note. See the -e option for details on determining the duration of the last note in each note column. Note that index values of -1 are used to indicate that there are no notes before the first note in the column (for --last data), and no notes after the last note in the column (for --next data). When multiple input files are given to the program, the next and last data columns do not span multiple inputs, so -1 indices will be found at the boundaries. However, the non-negative index values will increment continuously between multiple inputs. By default all global comments and reference records will be echoed into the output data as comments. These comments can be suppressed by using the -C option. To suppress global comments and only echo bibliographic (reference) records, use the -b option. For output formats other than the Humdrum file format (generated with the -H option), an initial comment line before the first data line describing each data column will be given unless the -I option is used to prevent its printing. By default, the notearray program generates one row in the output array for each data line in the input Humdrum file. The duration of each row can be calculated from the information column produced by the -a option (the absolute beat position for the row). The difference between each absolute beat position is the duration for the sonority of each row. However, the duration of the last row cannot be calculated without knowing when the last sonority is released. Therefore, the -e option can be used to generate a rest sonority after the end of the last sonority in the score to allow calculating the duration of the last row in the note array. In this example, the extra row in the output data allows the duration of the last sonority to be determined (6 - 4 = 2 beats). And the duration of the entire score is the absolute beat position of the rest in the last row (6 beats). A row of rests can be inserted in the output data when double barline occur in the score by specifying the --double option. This is useful to separate phrases in certain types of music. Using the -S option will suppress all output lines which contain only sustained notes. This is used to generate more parsimonious data. The -t option can be used to specify the duration of beats within the music. For example music in 6/8 will automatically be assumed to be in a compound meter with the beat equal to the dotted quarter note ("-t 4."). However, in certain cases the beats might instead be defined on the eighth-note level ("-t 8"). The following options work when multiple input files are given to the notearray program. The -mo option can be used to generate unique measure numbers in the output data when multiple files are given as an input. The -mo option is useful for keeping track of the source file in the output data when there are multiple input files. The option takes an integer argument which is the an increment in the measure number offset for each input file. For example if --mo 1000 is used, then a value of 1000 will be added to the measure numbers of the first file's output, 2000 to the second file's output, and so on. This allows the originating file to be identified in the output data (provided in this case that no file contains a measure number greater than 1000, in which case the increment should be set to 10,000). When multiple files are input, the absolute beat values generated by the -a option will continue across multiple files. To rest the absolute beat values for each input, use the --sa (--separate-absolute) option. Note in the following example that the third column (absolute beat) in the first output reset to zero at the start of the output for the second input file, while in the second notearray output starts the absolute beat position of the second file at the ending duration of the first file. To generate note arrays with a constant duration for each row, pre-process the Humdrum data with the standard Humdrum Toolkit program timebase. The timebase command is used to insert null record rows into the original data so that a constant spacing at the given rhythmic duration is given to each line of data. In the following example, the smallest rhythm is a sixteenth note, so the timebase rhythm is set to 16 which makes each line of data represent a sixteenth note. The output file contains 30279 sonorities from all of the chorales, with a total duration of 19814 quarter notes. The --sep option is used to place a comment line between analyses from different input files. The "--mo 1000" option is used to store the file name in the 1000's digit of the measure numbers in the output data. A simple method of separating sonorities occurring on the beat or off-beat can be done using the hgrep program to select tokens in the **beat column depending on whether they contain a decimal point or not. Sonorities on beats will have an integer beat position without a decimal point, while sonorities on offbeats will have a beat position containing a decimal point and a fractional part. Below is a screenshot of the above data loaded into an MS Excel spreadsheet (xlsx, xls). The intervals between each voice are shown in the dark green box in the middle, with a histogram calculated in the light green box on the right which is plotted underneath. Note that the hightlighed cell (H2) contains the equation "=MOD(ABS(D2))-ABS(C2),40)" which is the interval between the tenor and bass voices (collapsed to less than an octave). Columns O and P contain a mapping of the interval value to a more musical name for the interval, with 11 being a minor third (m3). Click on the image for a larger view. The notearray program can only process monophonic parts. To process parts containing sub-spines, treated as independent voices, you can use the sub-spine extraction options of extractx. Only a single voice will be extracted from each **kern spine. If the music in that spine splits into sub-voices, only the left-most subspine after the split will be stored in the output data. See the subspine options of extractx for methods of generating monophonic lines out of a polyphonic part. Only the first note in a chord (left-most note in a multi-stop token) are extractable into the note array. For music with very low notes, use the -o option to shift the octave encoding level upwards; otherwise, note attacks and sustains will become mixed up. For piano music, this means the bottom three notes of the keyboard: A-1, B♭-1, and B-1. C0 with the -d option and C♭♭0 for the default base-40 pitch enumerations will also cause problems, since the number 0 is intended to represent rests. Fermatas should be used to mark rest segmentation boundaries in the output data. Currently only the --double option will produce a rest segmentation. Linux (i386 processors) (dynamically linked) compiled on 13 Nov 2013. The source code for the program was last modified on 12 Nov 2013. Click here to go to the full source-code download page.